Sometimes the unexpected events of life put you in a little sensitive financial situation. For example, you need to do purchases related to the repair of the car or to hospital expenses. Or maybe, sometimes you simply need an extra money to do some home renovations but you are left with no alternative but to borrow a sum to make ends meet. If you are in this situation, there is a way out. Whether you are looking for funds to cover an emergency expense or you have got any other pressing need for money, Installment Loans might be the solution you are looking for! Installment Loan is money you borrow and that you have to pay back with flexible repayment options of 12 to 60 months. Most private lenders and banks offer Installment Loans. It consists of obtaining funds in one lump sum and to reimburse it periodically. You will never forget a transfer since they are done automatically. Indeed, the repayment goes into several automatic withdrawals directly deducted from your bank account. Installment Loans can be paid off bi-weekly or monthly. Beware of the interest rates which increase at a daily fixed date. So if you need access to large amounts of money quickly, Installment Loans are for you! Most companies can lend up to $10,000 and more. Another advantage of these loans is that they have much lower interest rates than payday loans. Payday Loans are typically used to loan small amounts ranging from $100 to $1,500. The loan is short-term and should be paid back in full in 30 days or less and have to be paid back on the borrower’s next paycheck. If the borrower is unable to repay it fully on time, he or she will receive additional fees and owes the original loan amount in another two to four weeks. While with Installment Loans, you have the opportunity to borrow more money than with a Payday Loans. Indeed, you can obtain up to several tens of thousands of dollars. The repayment period is longer (12 to 60 months) and the annual rate ranges are around 25% to 100% and more. Lastly, in case you are unable to repay the amount due, you may include collateral such as your car, jewelry or any other consumer electronics (real estate excluded). They are two main loans: unsecured and secured loans. The difference is that a secured loan is protected by a collateral. This is a personal property like a house or car which guarantee your repayment. Because the loan is less risky for lenders, they will offer low-interest rates. If you do not pay your loan on time, the lender can make legal advancements to secure the collateral. 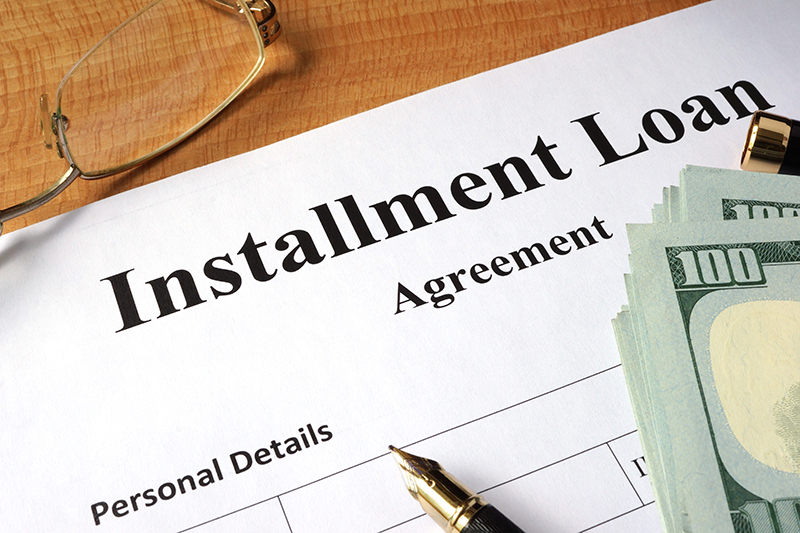 Installment Loan is considered to be a secured loan. If you opt for a Payday Loans, it might be considered to be an unsecured loan because it is a small amount of money that is easy to obtain but with high-interest rates. This is a way for lenders to protect themselves from bad payers. Car repairs: If your car needs urgent repairs, an Installment Loan can help you cover the cost. Overdue utility bills: An Installment Loan can cover your electricity bill and your internet and phone bills. Building a credit score: If your credit score needs improvement, think about applying for an Installment Loan. If you respect your payment deadlines, you can build or rebuild your credit score. Installment Loan can also be a great solution for newcomers in Canada who desire to create a credit report. Medical expenses: Installment Loans can pay off medical bills that are not covered by your insurance. An important advantage of Installment Loans is their manageability. It offers the possibility to make small repayment. This kind of payment will not threaten your financial security. It also offers fixed payments. They are paid off in a monthly or a biweekly period, which can help you manage your finances. There are no unpleasant surprises and no sudden jump in your Annual Percentage Rates (APR) which remains fixed. (APR is the annual percentage rate which corresponds to a numeric representation of your interest rate). Thanks to the small payments, you only have to pay a small interest. Here is a little advice: Transfer the major portion of your savings every month to a money market or fixed-income security that has a higher rate of return in the long run. You earn more than you spend in interests. Another advantage is the low cost of borrowing. The interest rate is relatively lower since you are spreading the repayment over a long period of time. As mentioned earlier, Installment Loans help to improve your credit score. Having a good credit report opens a world of options and possibilities for you. You can easily take out a mortgage for your future home or an auto loan for your first or next car. A good credit score eases the burden of financial stress. The first disadvantage is that lenders check your application very thoroughly. They verify elements like credit score, debt-to-income ratio and income certificates. You must know that the level of verification is much higher than any short-term loan. Unfortunately, prepayments may not be allowed everywhere. Some lenders do not encourage pre-closure of the loan even if you want to pay larger amounts per installment loan and close it earlier. Some lenders decide to charge penalty fees for pre-closure, and some simply want you to respect the predetermined terms of the loan. The most important criterion is a good credit score. You are expected to maintain a good credit score. You also need an acceptable debt-to-income ratio. When you are searching for a private lender, pay attention to any debt trap. There are a few tips which will help you avoid them. Does your lender offer loan renewal options? This option is vital if you cannot pay on time. You might want to look somewhere else if this option is not available, because you can fall into a vicious cycle of debt. Pay attention to the terms “guaranteed approval”. Obviously, most reputable lenders want to make sure you can pay off your debt first. In conclusion, Installment Loans are a good solution if you need access to funds rapidly. Their many advantages such as fixed payments and low cost make them the loan of choice for consumers who desire to move to a new house, buy a new car or even pay utility bills. Working with a responsible lender can help you get out of the cycle of living paycheck to paycheck. Next Next post: Loan Forgiveness for Family Doctors and Nurses: What Is It?